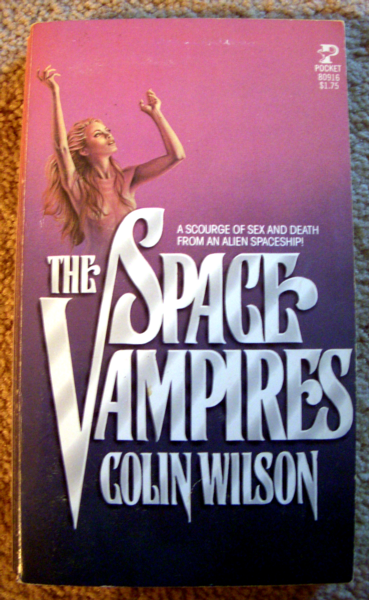 I had meetings with Cannon Films back in the 80s to adapt Colin Wilson’s popular science fiction novel, Space Vampires, into a feature. That film eventually became the cult movie Lifeforce, written and directed by Tobe Hooper of Texas Chainsaws Massacre fame. Instead, I was hired to script another film Cannon was developing and very excited about called Space Bounty Hunter. This film was very important to them because it was using a new technology called “Wonder-Vision” that was going to relaunch a 3-D revolution in film. What a crazy idea, right? 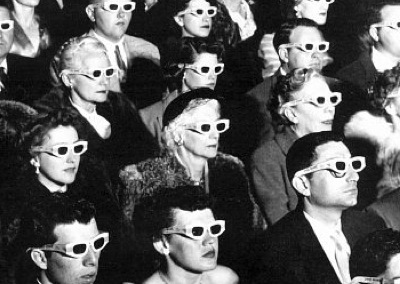 3-D movies hadn’t been popular since the mid 1950s, when they were first introduced as a gimmick to pull viewers away from this new thing called television. It turns out another space bounty hunter movie was already in development, so the entire concept of the picture changed to a mythological El Cid-style chariot race action adventure on another planet. 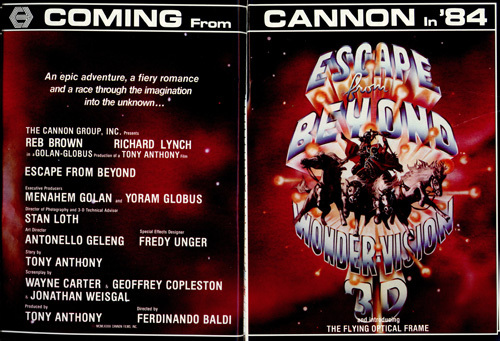 The new title was called Escape From Beyond, and the film was promoted with posters and pre-sold for international distribution at the Cannes Film Festival in France. But a funny thing happened on the way to building the sets in Mexico and training the chariot stunt crews … chariot races are really expensive. Go ask Cecil B. DeMille, the director of Ben Hur (oops, too late, he was dead). The preproduction and film were eventually abandoned when they realized the costs were far beyond what they collected up front to distribute the film internationally (which was Cannon’s business model). 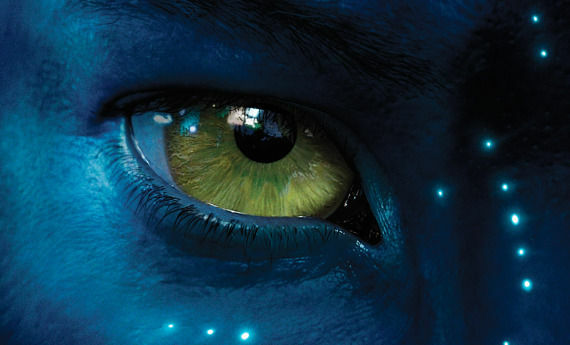 So the world never got to see the amazing relaunch of 3-D technology with a science fiction epic. Sigh. Too bad, huh? I went through seven drafts of that script, including one where the President of the company calmly told me, “Ve haf Charles Bronson.” I didn’t know what to make of that other than the fact they had a big success with is vigilante film Death Wish and two sequels. Was I supposed to suddenly turn this into Death Wish in Space? And if the movie was expensive enough with chariot races, what was Charles Bronson’s fee going to add to the cost? Who wants to survive a Zombie Apocalypse? I don’t know why zombies are all the rage these days. They’re more popular than when Val Newton directed I Walked With a Zombie in 1943, or when George Romero redirected them at us in Night of the Living Dead in 1968. Is it a manifestation of our global pessimism? Is it a reflection of a culture that often seems devoid of passion and ‘going through the motions’ – working, shopping, school, and groceries? I believe Shaun of the Dead covered that territory quite hysterically. The fact it took Shaun days to realize that everyone around him had already turned into zombies said everything. We are self-involved and clueless. More often than not in our daily routines, we’re just going through the motions. My son has played Left 4 Dead on xBox for a couple years now. He’s a veteran zombie killer. I even bought him a Zombie Survival Guide for Christmas one year. It’s fun to strategize exactly where you’d best hold out against the zombie hoards longing to eat your flesh or brain: Someplace accessible to food, but also where you are inaccessible asfood. At times, my son revealed a fear of zombies, as if they could be real. No scientific or biological explanation of the impossibilities of reanimated flesh or organs after brain death can ease such anxiety once repetitive media viewings without any real science or biology have taken hold. Just ask the climate change and evolution deniers who get their information from FOX News. But my question isn’t about how zombies actually function, or whether they move fast or slow, prefer human brain to animal brains, or why our culture is so agog with them. 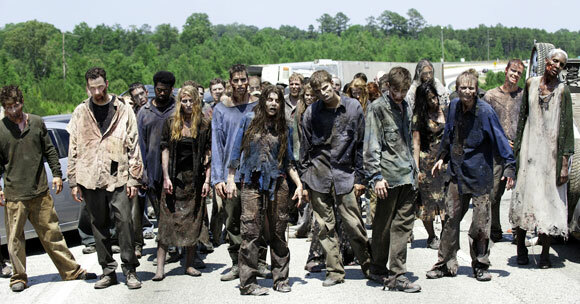 My question is why anyone would want to survive in a world overrun by zombies after some apocalyptic event or plague. 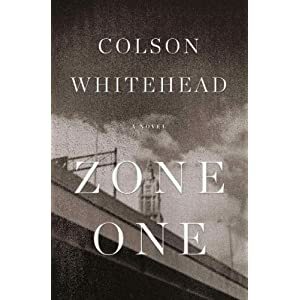 Not your run of the mill plague, mind you, but some global catastrophe where 95% of the world is either dead or infected: A scenario such as the one in Colson Whitehead’s new bestseller, Zone One; or in the popular AMC series, The Walking Dead. One of the characters in the TV series, Andrea, is denied access to a gun because, God forbid, she might actually want to kill herself rather than go on dodging brain munchers. But in the face of an unrelenting world of the walking dead, where everyone you ever loved is either dead or infected, and any chance of some quality of life is long gone … what’s so crazy about that? She may be the last rational human on Earth. Oh, what, you think you’re going to re-populate the earth like Adam and Eve? Good luck with that fantasy. Again, you’re talking about some basic mindless drive to propagate the species, and not any reasonable grasp of the situation. You think romance will bloom among the rotting corpses and devastation surrounding you? Only in the movies. The despair, the horror, the loss, the physical degradation … the lack of anything life-affirming, the relentless pursuit of you by nightmarish walking corpses … Is that really the scenario for turning on your auto-pilot to keep pushing on? Am I off way base here? Am I all alone in the world with this idea? Is Andrea in The Walking Dead wrong for contemplating the quickest exit? Or the tormented father at the end of The Mist (okay, bad example, he doesn’t realize help is on the way and the monsters were just in the mist). Holocaust survivors who survived concentration camps in World War II at least knew there was a world outside the camps where family and life might actually still be continuing and could return to normal after the conflict. But we’re talking Zombie Apocalypse here. The entire population of Earth is wiped out. You know this because you heard the reports up until the moment there was no one left to give the reports. So now you think you’re going to walk along The Road, or find an army base 28 Days Later where things are going to vastly improve? Where you can start your comic book collection again? Writers and filmmakers are always going to create stories about The Last Man on Earth. It’s an irresistible fantasy in a world where we are so often annoyed by those living all around us. Richard Matheson, my favorite author growing up, did just that with that last man classic (remade as The Omega Man, and later with his original title, I Am Legend). It’s an author’s conceit to destroy and re-imagine the world in his head, and then on paper, or for your Kindle. But let’s be honest. In a world where you spend your days alone, your loved ones dead, your food sources reduced to expired canned beans, and the never-ending grind of zombies shuffling slowly (or rapidly) after you to devour your brain; wouldn’t it ultimately be the worst fate of all … to survive? You are currently browsing the Hollywoodaholic blog archives for November, 2011.